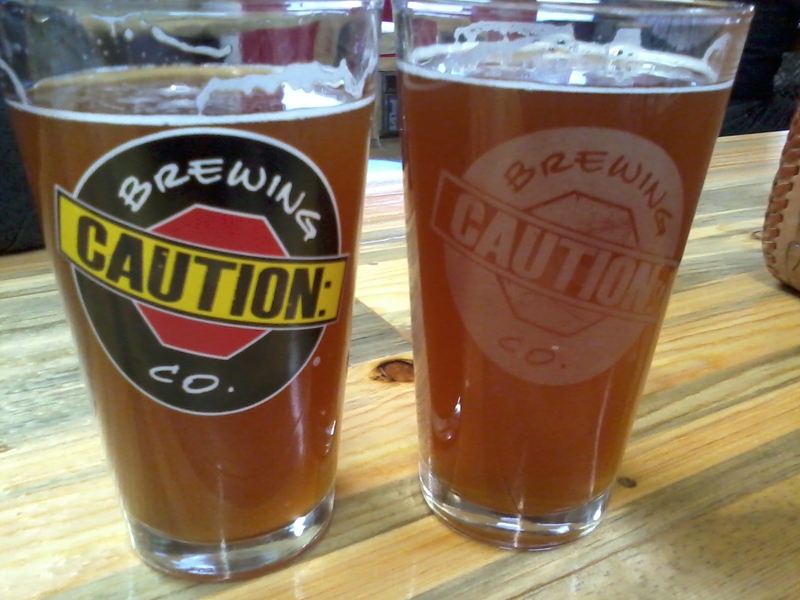 I stopped by Caution Brewing Co.‘s booth at GABF to sample some of their beers. I liked what I tasted so I decided to make a trip to the brewery last weekend. When I looked up their hours, I saw an announcement that its owners happened to be getting married that very day, and their ceremony was to be live streamed for the world (o.k., the taproom) to watch. So I prepared to drink some beer and watch a wedding. Caution isn’t in the most conspicuous location (12445 E. 39th Ave., Unit 314, Denver, CO). They even have little coaster-sized maps printed up as a helpful tool for visitors. But it wasn’t difficult to find, and I was ready to get inside and warm up with some brews on such a cold, dreary day. I started off with their Hippity Hops Chrysanthemum IPA (shocking, I know). It was a tasty beer made with three different kinds of hops (the spec sheet doesn’t spell out which ones though), whole flower chrysanthemum, and Chinese rock brown sugar. At 60 IBUs it’s easy to drink, and I think even those who don’t normally love IPAs might like it as well. Next I sampled my friend’s Toaster Bat Black Smoked Robust Porter. While I like mildly smoked beers, this one was just too much for me. But for anyone who wants an extremely smoky flavor, this is the beer. And I know many folks who enjoy that, so I’d definitely recommend it if you’re one of them. I moved on to the Big Bunny Cascadian Dark Ale, which they refer to as “a natural big brother to our Hippity Hops.” This one has 75 IBUs and is dry hopped with Palisade and Centennial hops. Really good. It was very hoppy, which of course I love, and it was just what my taste buds were looking for. This was my favorite without a doubt and will keep me going back to Caution. The owners’ wedding was streaming the entire time, though the inclement weather may have had something to do with the reception, as often times it wasn’t too clear and cut in and out some. But it was definitely a neat experience, and it seemed that some of the others who were there that day were happy and excited to watch the nuptials. There was a great sense of community in the air, which fits right into the craft beer culture and was inspiring to see. 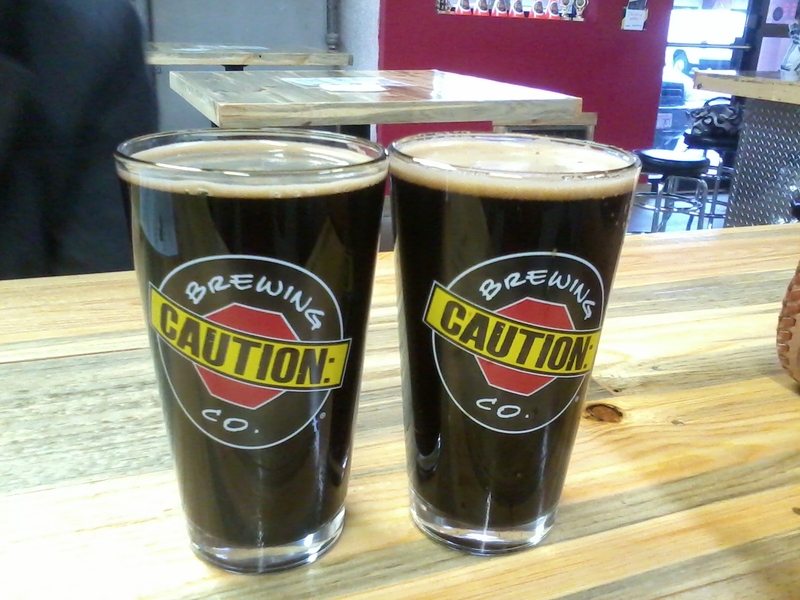 I had a great time at Caution, and I recommend paying them a visit very soon. Next Post Blue Moon: They actually brew good beer?! Have yet to try Caution…even though it’s pretty far for me. Love your blog & recently started following ~ Cheers!